I'm one of the sponsors of the Night Owl Romance Summer Fun Scavenger Hunt. During this event, I'm going to help you find some great new books. Make sure to check my featured title out along the way. Come join in the fun at Night Owl Romance! "Chasing a Highland Moon" is my 3rd book in The Highland Moon Series. The hero, Cinead, or "Cin" was a secondary character in my second book, "Once Upon a Highland Moon." Here is an excerpt from "Chasing a Highland Moon." "Come," he said, his voice a soft timbre that sent a shiver over her skin. Claire opened the door. Saints above! He was taking a bath. She squeezed her eyes shut tight and quickly turned her back to him. "I-I-I've yer whisky, m'laird," she said in a voice unsteady even to her own ears. "Then bring it here, lass." Claire slowly turned around and walked toward the tub, keeping her eyes fastened on his face. His eye and the bruise on his cheek were almost completely healed, and she could now see what an attractive man he truly was. When she handed him the bottle, his devilish grin sent her insides into a spin. He raised a brow. "Could you fetch me a cup from the table? Or should I get it myself?" He shifted, as if he were about to rise out of the tub. "Nay," she squeaked, quickly grabbing the cup and handing it to him. He grinned and settled back against the tub. "Much thanks." He poured himself a dram of whisky and tossed it back, then poured another. He held up the cup. "Would you like a wee dram, lass?" Claire shook her head, even though she more than likely needed one at the moment. He shrugged. "Suit yourself. But if you should change your mind, let me ken." She was mesmerized by the play of muscle in his arms and across his chest. The same muscles that had been hard and smooth beneath her hands. Her whole body suddenly felt flushed, as if by a fever. She had to get out of the bedchamber—and away from him and the wanton way he made her feel. "If ye're in need of naught else, I'll be taking my leave now." She turned to go. "I'm afraid I am in need of your help, lass." She turned back around. "In what way, m'laird?" "My hair and my back." Saints above! What was he talking about? "M'laird?" "My ribs have not entirely healed and I am unable to reach my back. Would you mind?" He smiled, holding the soap out to her. She reluctantly took the sandalwood scented cake and moved to stand behind him. She had never washed anyone's hair in her life, and until recently, Alice had washed Claire's since she was a child. Claire hesitated. "I'm afraid I might hurt yer head." "Dinnae fash yourself, lass. You'll no' hurt me." Claire took a deep breath. "Very well." She lifted the bucket of water left beside the tub, and slowly poured half of it over Cin's head, then set it back down. After achieving a good lather, she worked it through his long hair, ever mindful of his injury while she did. Once it was clean, she rinsed the suds away with the rest of the water. "Finished, m'laird," she said, admiring the wet tendrils hanging well past his shoulders. "Much thanks, Jenny. Now my back, if you dinnae mind." He leaned forward and waited. She slowly ran the soap over his skin, making certain she did not miss a spot. Long after she was finished, she let her hands travel over his shoulders, down his back and over his ribs, for she ever so much enjoyed touching him. Sensations she had never experienced centered in the pit of her stomach and moved outward over her entire body. Cin groaned and she yanked her hand away, fearing she might have hurt him. "'Tis done," she said, trying to keep her trembling voice steady, but feared she was not doing a very good job. She dried her hands and picked up the empty tray. Cin leaned back and looked at her, his gaze much darker than before. "Dinnae fash yourself, lass. I'm no' in the habit of seducing my servants, however beautiful they may be. His blue eyes twinkled as his mouth curved into a wicked grin. Claire couldn't breathe. She dropped her gaze, tightening her grip on the tray until her knuckles turned white. "If there be naught else, m'laird, I'll take m' leave." Cin was silent for a moment, then spoke. "That will be all." "Aye, m'laird." She curtsied and could not get out of his bedchamber quickly enough. 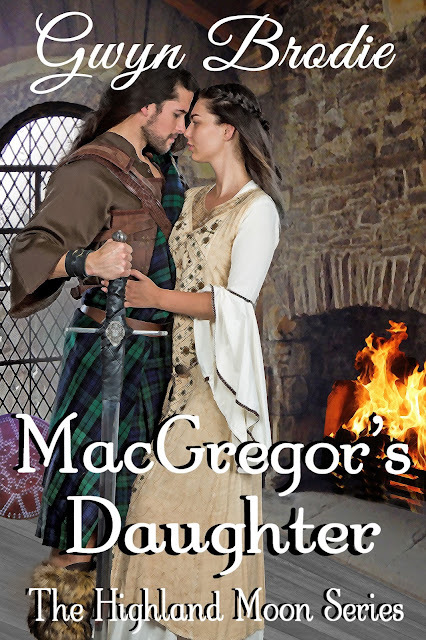 She hurried down the corridor and as far away from Cin MacLeod's sinful gaze as she could possibly get. Stopping short of entering the kitchen, she leaned against the stone wall and blew out a breath to steady her nerves, as well as her trembling hands. Saints above! The man was far too attractive. Today I did a post at History Undressed about Glamis Castle, thought to be the most haunted castle in Scotland.